Stockholm University Baltic Sea centre has been building a new research vessel for research in the Baltic Proper. The vessel, R/V Electra, was delivered in june 2016 and she has already had an intense premiere season 2017. - This new vessel will make a great difference for how marine researchers at our university can work with many different marine questions and promote collaboration across disciplines, says Christoph Humborg, scientific leader at Baltic Sea Centre. Its modern technical properties of high standard makes it possible for us to understand the world below the surface already during the expedition. The new ice-breaking vessel is 24,3 metres long and 7 metres wide. It is equipped with technical instruments for water- sediment- and geophysical sampling. Thanks to modern ship technique and low-impact engines R/V Electra has exceptional functionality to work in a larger geographical area. 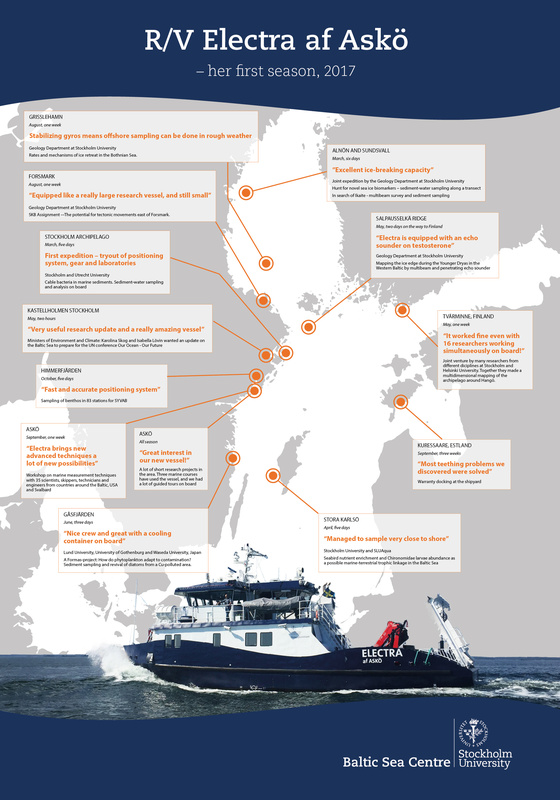 This enhances the research range reachable with the Askö Laboratory vessel fleet. At 24 metres long and packed with high-tech equipment, Stockholm University’s new research vessel R/V Electra af Askö has been carefully adapted to research in the Baltic Sea. The vessel will give researchers across an array of disciplines a more complete picture of the Baltic Sea. The Erling-Persson family foundation decided in 2013 to contribute with 30 mSEK to Stockholm University for building a new modern ice-breaking research vessel. In July 2014 a contract was signed with a shipbuilding yard. The vessel was delivered in june 2016. About Electra in the news!